Fulda, March 17, 2017. 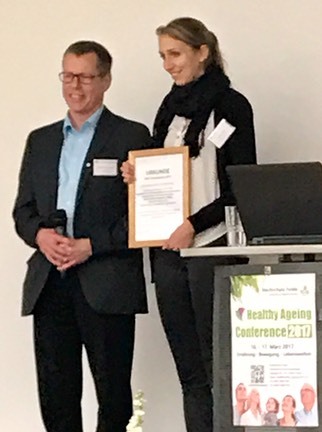 In frame of the first „Healthy Aging Conference“ one of two prizes were awarded to Carmina Silaidos, who presented her poster entitled "Geschlechts-und Altersspezifische Unterschiede der mitochondrialen Funktion in peripheren mononukleären Blutzellen (PBMC) und im Gehirn“ [Gender and aged specific differences of mitochondrial function in peripheral mononuclear blood cells (PBMC) and in the brain]. Carmina presented her work showing for the first time gender differences in engery metablites in both peripheral blood cells and the brain. The poster was based on a joint research project bringing together partners at the clincs of Goethe-Universitly of Frankfurt and its brain imaging center.